Q1 : Why do we need to use special terms and concepts in sociology? 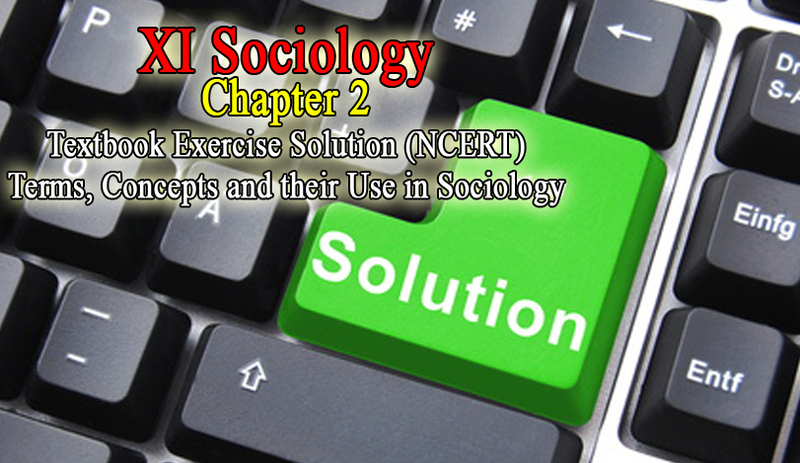 We need to use special terms and concepts in sociology to understand the society better. In sociology, there are different ways of understanding the society. For example, Max Weber gave importance to individuals for existence of a society whereas Emile Durkheim laid emphasis on society as a whole. For Karl Marx, the key concepts were class and conflict to understand society whereas for Emile Durkheim, social solidarity and collective conscience were important. There are different kinds of individuals and groups in society that leads to different concepts and ideas. Therefore, we need special terms and concepts in sociology to differentiate it from our common sense knowledge of society. An individual studies the society on the basis of his/her own common sense, which is often within a limited range, while sociology provides specific concepts and terms to study the structure, phenomenon and functions of the society in a scientific way. Q2 : As a member of society you must be interacting with and in different groups. How do you see these groups from a sociological perspective? We interact with different groups in our daily lives. The students of a classroom form a social group of that class and an individual (you) is a part of that group. The individual has some of the classmates as his/her friends and this group of friends forms theprimary group where interaction takes place with intimacy and co-operation while the rest of the class forms the secondary group. The group of students of the class sharing common interest and ideas interact with each other in a formal manner. The friends of the individual from the class also shares common interests and ideas but with informal ways of interaction. An individual also interacts with the students association which forms a secondary group based on specific goals. The individual discusses his/her school problems with the members of these groups and the members help him/her. Q3 : What have you observed about the stratification system existing in your society? How areindividual lives affected by stratification? Social stratification refers to the existence of structured inequalities between groups in a society, in terms of their access to materials or symbolic rewards. Historically, there have been four basic systems of stratification- slavery, caste, estate and class. In India, there are several stratifications on the basis of caste, class, gender etc. In several organisations, stratification exists on the basis of the roles of the employees. The life of the individuals is affected by stratification because people are placed in higher or lower strata. The lower strata is devoid of certain symbolic rewards and material advantages which improve the quality of the life of the recipient such as wealth, income, health, security in a job, etc. On the other hand, the higher strata enjoys all the benefits of the society. These material benefits or privileged position are also passed on to the future generations of the higher strata. Q4 : What is social control? Do you think the modes of social control in different spheres of society are different? Discuss. Social control refers to the social processes, techniques and strategies by which the behaviour of anindividual or a group is regulated. (i) The formal social control, which is formal, official and codified. Its agents are law and the state. (ii) Informal social control, which is personal, unofficial and uncodified. For example, family, religion and kinship. This mode of social control is very effective in our daily life. However, this form of social control may not be adequate to enforce conformity or obedience. Social control can also be either positive or negative, as in the case of sanctions. It is a mode of reward or punishment that enforces socially expected forms of behaviour. In this case, individuals are rewarded for their good behaviour and are punished for their offence in the society. The modes of social control in different societies are different because in pre-modern societies, the caste system controlled and regulated the activities of individuals and kept a check on violation against the prescribed norms. Likewise, in modern societies the government and the state control its citizens and act as agents of social order. Different societies have different norms and values, different structure and functions. Therefore, they have accordingly different techniques and strategies of social control. Q5 : Identify the different roles and status that you play and are located in. Do you think roles and status change? Discuss when and how they change. An individual (you) has many roles and status. For instance, a student whose duty is to study, also plays the role of a son or a daughter. He/she enjoys the status of being a son or a daughter. This status will not change but a new status of husband or wife would get attached to him/her once he/she gets married. Later, the status of being a mother or a father would also apply to him/her. Not only this, but the individual also plays the role of a brother, sister, nephew, niece, friend, etc. Similarly, the status and duties of being a student would change accordingly, once his/her studies get over and he/she gets employed. In this way, the status and role of the individual (you) changes according to time and place and thenew status and roles get attached to the individual.